I have been hearing so much about the Trim Healthy Mama diet plan by sisters Pearl Barrett and Serene Allison. 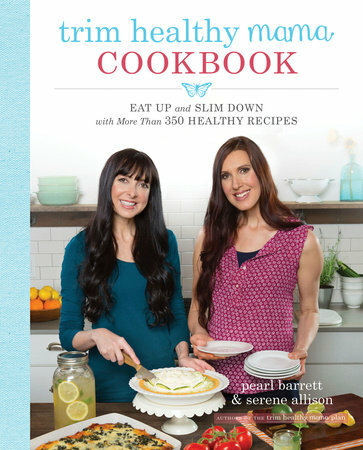 Their first book caught the attention of many mamas who were looking to eat healthier, control blood sugar, lose weight, and keep the weight off. Then, more recently, two new books by the sisters were published through Penguin Random House. One is the new updated THM plan book, Trim Healthy Mama Plan. And, the other is the Trim Healthy Mama Cookbook. I haven't read the "plan" book yet, but I did get a copy of the cookbook. I wanted to see what kinds of recipes can be made on this THM plan. As I read it, I found the sisters have a unique sense of humor that gives the book a fun, light tone; and it has some interesting recipes I am sure I will be trying in future months - things like Reuben in a Bowl, Fotato Soup, Taco Meatloaf, and the Pumpkin Pie Sip (a beverage that is meant to be sipped throughout the day to curb hunger). However, if you are wanting to know more about the THM plan, you will need more than the cookbook to really understand it. The cookbook is meant to supplement the "plan" book; and, if you want the recipes to really work for you, it is best to actually KNOW the plan first. Pearl and Serene even mention this in the introduction to the cookbook. On its own, the cookbook is colorful, laid out well, and includes more than 350 recipes including one-pot meals, main dishes, sides, breakfasts, sweet treats, and beverages. If you are already doing the THM plan, and are wanting some new recipes to try, I recommend you get this cookbook. I have been following THM for over a year, and have lost close to 30 lbs. I love that it is a lifestyle and not a diet. I also love that the sisters are born again Christians and also funny and kind of quirky too! The plan is not just for mammas but the family too. This cookbook is awesome! Thanks for sharing, Stephanie! I agree that its not really a diet, but a lifestyle.